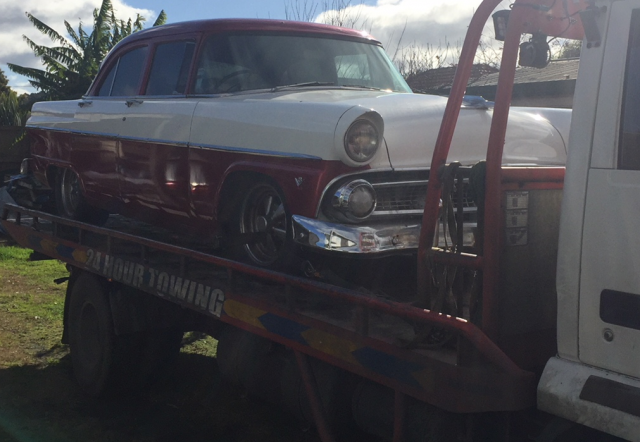 Yesterday Kawerau Police seized a 1955 Ford Customline car. The seizure is part of the ongoing operation to strip offenders of the assets they have allegedly acquired through the profits of the sale and supply of methamphetamine to the Kawerau community. We are continuing with our tireless efforts to target those who supply drugs to our community, but equally important is to ensure that those selling methamphetamine aren’t able to build and enjoy nest eggs of assets on the back of the suffering and misery of others. As part of our follow up in Kawerau we are looking to strengthen and build resilience in the community and are working with other agencies to support those that have been affected by methamphetamine. Part of this involves contacting all identified users of methamphetamine and proving them with guidance and advice about seeking help. We continue to urge all those affected by methamphetamine addiction to seek help through the Alcohol and Drug Helpline 0800 787797 or free text 1737 to speak with a trained counsellor. For those who continue to sell methamphetamine to our whanau, without any thought to the ongoing damage it is causing, it is only a matter of when and not if you get that early morning knock on your door from us with very bad news. Crime does not pay. Police encourage anyone with information regarding the supply of methamphetamine to contact the Kawerau Police (07) 323 1400 or Crimestoppers anonymously 0800 555 111.